is to wake up to who you truly are. You are not merely a personal being. You are the living spirit of Truth. You are the light of consciousness revealing all. devoid of desire and attachment. that shines from the source of existence. This Satsang Intensive with Mooji is a powerful non-residential retreat in the heart of one of Europe’s most beautiful cities. It offers the opportunity to be immersed in the energy field of Satsang—of genuine introspection and contemplation, while still moving in your worldly activities. These five days are a compelling invitation to everyone who is called by the inner voice of the Heart to come to the full recognition of their true Self. 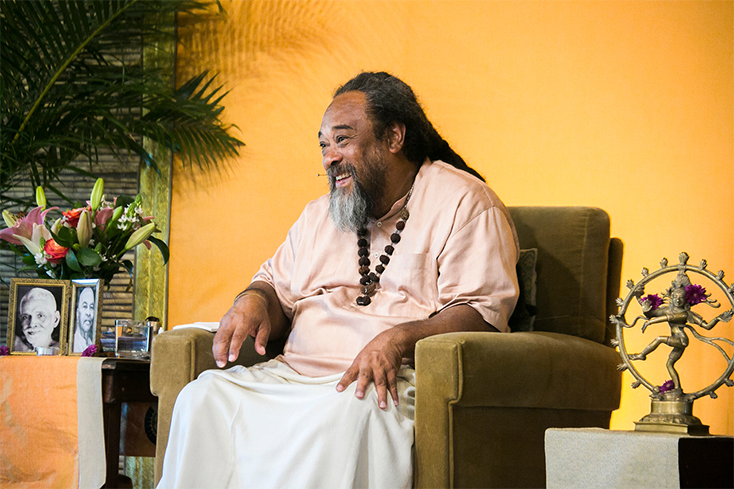 Mooji introduces Satsang as the most effective aid for true and lasting self-discovery. His presence, guidance and words encourage, challenge and never fail to illuminate. Satsang will take place twice each day, offering a supportive and loving space where Mooji answers and guides genuine seekers of peace and freedom into the direct recognition of the timeless Truth. Participants arrange their own food and accommodation, however silence is encouraged to support the deep introspection offered in Satsang. While silence means to keep quiet externally and refrain from contact with those around us as much as possible, it also means to introvert our attention and rest it in Being. 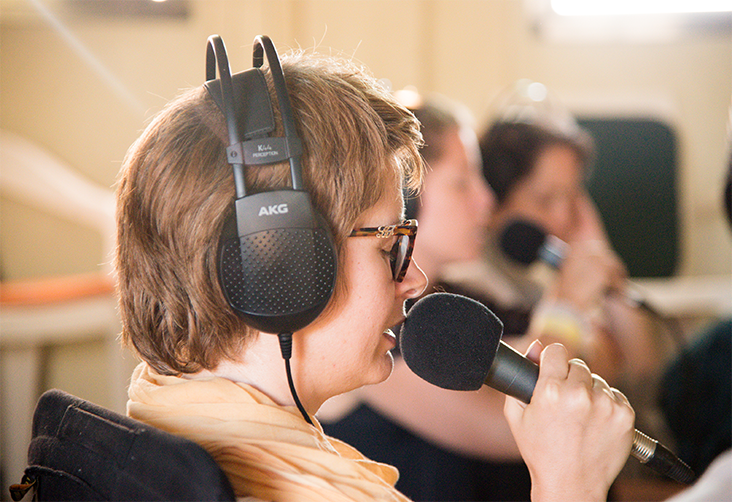 This Satsang Intensive with Mooji is for those who are genuinely drawn to Self-discovery. This environment is not for the merely curious, but for those with a sincere commitment to participating fully and a willingness to adhere to the following guidelines, which are in full support of Satsang. • Approach the retreat with the understanding that it is not a casual event—it is for true and lasting self-discovery. • Attend every day and every Satsang of the Intensive; and to stay in the Satsang Hall until Mooji has exited the space. • Present questions to Mooji in an open and honest way. Please also understand and respect that it is during Satsang that Mooji invites questions—he will not receive questions afterwards. • Move in silence before, during and after the satsang sessions. Keep your interactions with others to a minimum so as to be immersed fully in the Satsang. Take all necessary interactions outside the building. • Switch off mobile phones or tablets completely during Satsang. Even a muted phone can interfere with the sound. • Do not take photos or videos inside the Satsang Hall. We have designated photographers and we will post photos on the website. • Wear modest clothing throughout the retreat, avoiding tight, revealing or transparent clothes. Women are asked to cover their shoulders; sleeveless T-shirts with wide straps are okay. Men are asked to avoid sleeveless tops altogether. Knee-length shorts are okay for both men and women. • Have your image and voice recorded and possibly used for the sharing of Satsang on DVD, mp3 and on the Internet. All recorded material will be used to serve satsang only. Images of all individuals will be treated with the utmost sensitivity and respect. • Check with a healthcare practitioner whether attending the Intensive is suitable for you if you are currently receiving any medical treatment or therapy for issues related to mental health. This Satsang Intensive is not intended as a replacement for any therapy or other medical treatment. • The use of intoxicants or recreational drugs is strictly prohibited for the duration of this Intensive. • Watch this important video before registering to attend this event: An Invitation to Freedom. The Aula Magna is located in the Rectory of the University of Lisbon. This impressive amphitheatre-style concert hall stages the concerts of many international performing artists, thanks to its excellent acoustics and accessibility. This spacious and comfortable environment is ideal for the full immersive experience of being in Satsang. 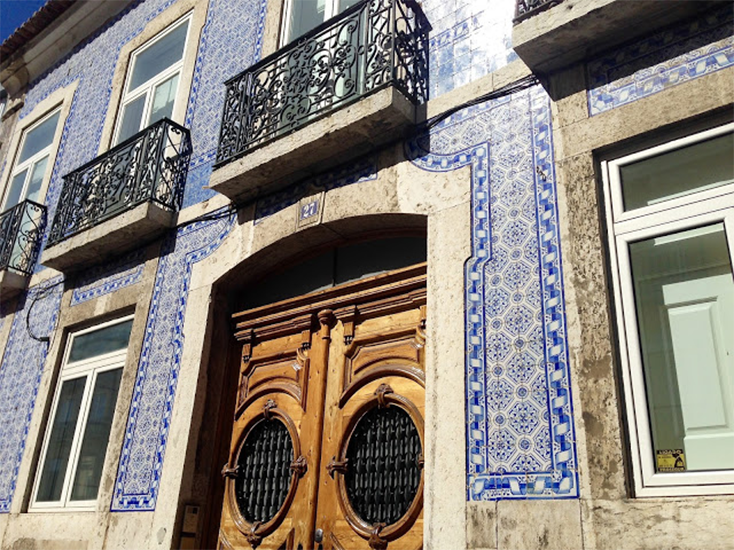 Situated conveniently at the heart of the University of Lisbon, the Aula Magna has ample parking and is easily accessed through the Lisbon Metro station, Cidade Universitária. Português; Français; Español; русский, Italiano; Română. Please ensure you tick the appropriate box when you register to request a translation and you will receive information about the translation service by email. There are no dialogues in the world. It is all a divine monologue. For in reality there are not two. in its appearance as many. Doors will close 15 minutes after the scheduled start time for Satsang. Please be seated before Satsang begins. Late arrivals may not be granted entry into the Satsang Hall. Food is not included as part of this event, so it is up to each participant to arrange their own snacks and meals. There is a range of cafés and restaurants close the venue to choose from. No food is to be consumed in the Satsang Hall, but a bottle of water is recommended. Lisbon Airport (LIS), also known as ‘Lisbon Portela Airport’ or ‘Lisbon Humberto Delgado Airport’ is just 6km from the Aula Magna, and 7km from the centre of Lisbon. The airport is very well connected by Metro, bus and taxi. Many national and international trains arrive in Lisbon every day. The main station is Gare do Oriente (also known as Lisboa-Oriente), however another major station is Entrecampos, and the terminal station is Santa Apolónia. All the stations have direct bus and underground connections to the city centre. For more information on trains in Portugal please visit Comboios de Portugal. 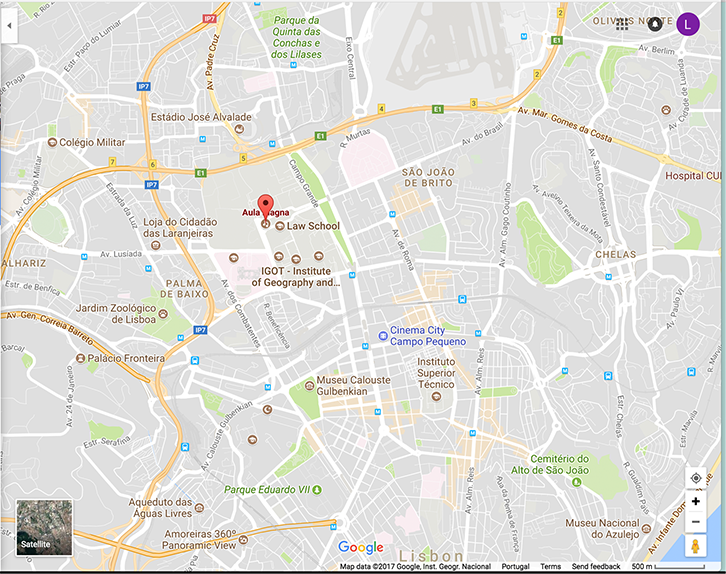 The closest Metro station is Cidade Universitária (on the yellow line). It is a 1 minute walk from Cidade Universitária to the Aula Magna. The stop is Cidade Universitaria. It takes around 20 minutes from the airport to the venue by bus. Lisbon Metro begins service at 06:30 and closes shortly after midnight. You can find out more about this on Metropolitano de Lisboa. To use the Metro you will need to purchase a VIVA card when you make your first trip. It costs 0,50€ and you can top it up as you go. Buses are also available day and night. Please visit Carris — Transportes-Lisboa. Buses accept VIVA card (see above) and cash. You can also use Uber or Cabify in Lisbon. There are two ways to participate in the Satsang Intensive. 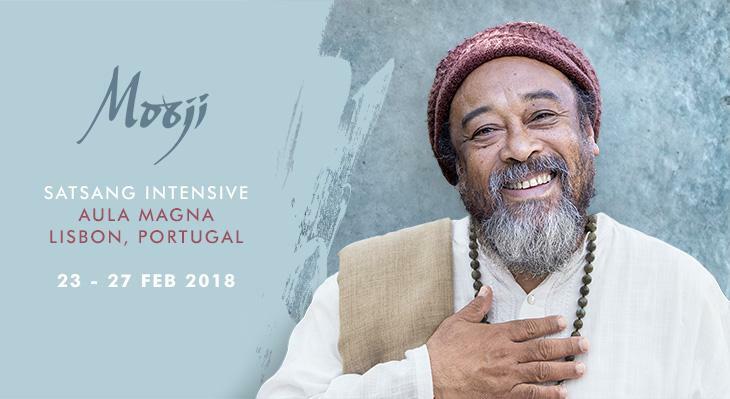 You can come to Lisbon to be in Mooji’s physical presence at the Aula Magna, or you can join the Live Internet Broadcast through Mooji TV. Being in the physical presence of a living Master and fully immersing yourself in the energy field of Satsang is a rare and blessed opportunity. Mooji’s loving and unfathomable presence itself can trigger transformation in one who is ripe for awakening. Although the Aula Magna is a large venue, please be aware that places are limited so registering online in advance is essential. After you have successfully registered, you will receive a confirmation email which contains a link to your ticket and to a release form. You can either print this digital ticket and bring it along, or store it in your smart phone. Please be aware that the tickets for this event are non-transferable and cannot be passed on to be used by another person. If you do not receive a confirmation email after registering, please write to events@mooji.org. If you are unable to attend physically in Lisbon, joining via Live Internet Broadcast is an excellent alternative. You will have access to the daily Satsangs in real-time, as well as to the additional scheduled events such as Bhajans. For Moojji there is no separation, no distance to those joining online and he sees absolutely no hindrance or disadvantage to your awakening in attending in this way. Registration is via Mooji TV and can take place right up to the start of the event. Regardless whether you attend in-person or online, an Intensive is more than just the scheduled events, and it is highly recommended that you arrange plenty of quiet, contemplative time and space for yourself. The time you spend prior to and after Satsang is of utmost importance to allow the pointings to settle deeply inside your heart.